Solar hot water systems (SHW) use basic thermal principles to capture incoming solar radiation and heat water for domestic and other uses. Over the years, a variety of system designs have been developed and tested to meet specific consumer needs and conditions. Due to the cold climate in the Northeast we use primarily closed-loop systems with a 50/50 glycol mix. The main difference between domestic and commercial systems is the sizing of components and the number of thermal collectors required. As a general rule, a smaller family would require 1-2 collectors with an 80 gallon storage tank. A larger family might require 3 collectors with a 160 gallon solar storage tank. The average solar hot water system will provide up to 70% of your family’s hot water needs. Businesses that use a lot of hot water are excellent candidates for a solar hot water system, including gymnasiums, laundromats, restaurants, car washes, pools and factories that use a lot of hot water in the manufacturing process. We can use either flat plate solar collectors or evacuated tube solar collectors. Evacuated tube solar collectors perform better during cold or cloudy days; flat plate collectors perform better during the summer months. Collector arrays can be mounted on a sloped or a flat roof, on the south wall of your building, or even on the ground. Solar hot water systems use the “greenhouse effect” to heat water in a thermal collector with a suitably sized storage tank, for use in homes and businesses. SHW works as a pre-heat system that operates in series with your existing heating source by preheating the incoming cold domestic water, with the existing hot water heater as a backup. There is usually no need to alter your existing hot water heating system. If the water in the solar storage tank is hotter than the temperature setting in the primary tank, then the solar heated water passes through without further heating. If the water in the solar storage tank is cooler than the temperature setting in the primary tank, then additional heating is provided by existing or backup system. This means you get hot water from the solar system when the sun is shining, with assist from the backup system when the sun is not shining. SHW uses energy from the sun to offset the cost of fossil fuels or conventional electricity normally used to heat your water. Over the year an SHW system can provide as much as 60%-65% of all water heating needs, even in cold climates. During the summer months the system operates at its maximum with little extra heating from conventional sources required. Given that about 20-40 percent of the average family’s energy use comes from the cost of operating a domestic water heater (domestic hot water is the second highest energy cost in a typical household), the savings garnered from an SHW system, and the increase in home resale value, will usually repay the cost of installation within 6-8 years, the fastest payback of any renewable energy system. This is accomplished by reducing your energy bill and reliance on imported fossil fuels. And, over the next 30+ years of its life expectancy, your SHW system is actually putting money back in your pocket! SHW systems generate hot water for use in the home or business. 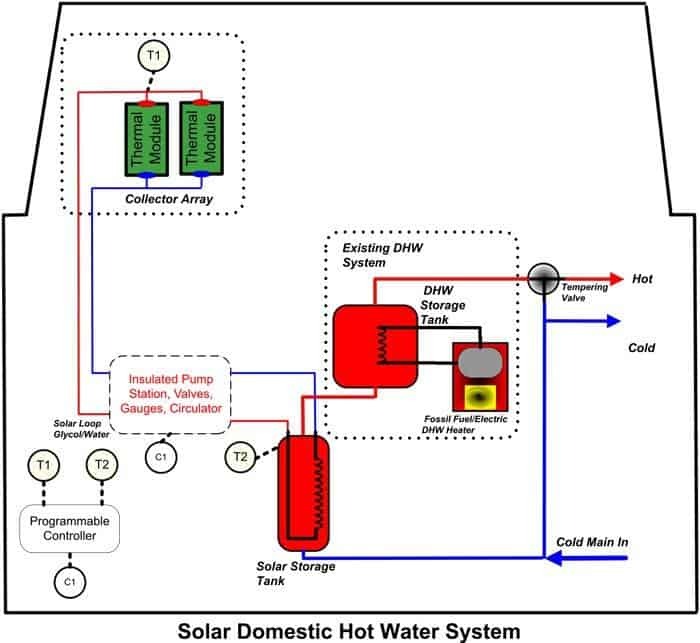 As shown in the diagram with this article, solar hot water systems are made up of collectors, storage tanks, and the solar loop (piping, controls, heat exchangers, circulators, gauges, valves, etc.). Thermal collectors, either flat plate or evacuated tube, absorb the thermal energy in sunlight. The collectors should be generally south facing (+/- 30 degrees of true south), at a 45 degree angle to the horizon, and unshaded from 9 am to 3 pm. Less than optimal orientation can be compensated for with additional collectors. A pump circulates a glycol-water mixture, transferring heat energy from the collectors through a heat exchanger to a solar storage tank, where incoming cold water is pre-heated for domestic or commercial use. Solar storage tanks can range in size from 60-120 gallons for domestic use and from 160-2500 gallons for commercial use. Reliable: Solar hot water systems are designed to provide hot water using the clean power of the sun first and other fuel sources as a backup. Affordable: Tax credits and state incentives reduce your cost, making solar hot water affordable everywhere. 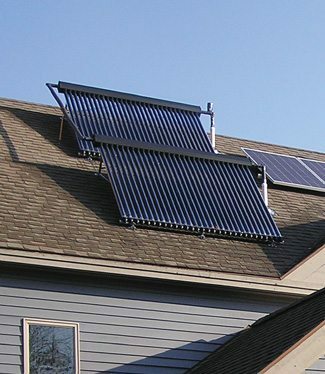 A typical solar hot water system will reduce fuel use by as much as 65%, saving you money. Solar energy is stable in price. The solar “fuel” is not susceptible to inflation or any political actions associated with other fuel sources. In addition, as other forms of energy continue to rise in cost, the returns from your solar heating system actually increase. Aesthetic: Looks great on almost any home. Flexible mounting hardware allows for installation on all types of roofs and walls, even on the ground. Environmental: Fossil fuel and electric water heating pollutes the air. Solar water heaters consume no fossil fuels, making your home safer and our planet cleaner. Converting to solar hot water does not produce any greenhouse gases that contribute to global warming, and therefore helps to conserve the earth’s resources for our children and grandchildren. Socially Secure: Reduced dependence on fossil fuels means reduced dependence on foreign and undependable energy sources. The sun rises every day, and provides clean, safe, reliable energy. Don Wemple lives in Bridgewater Corners, Vermont. 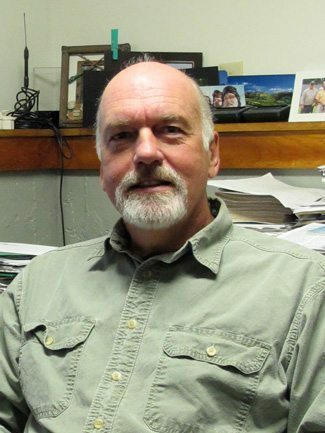 Along with designing and installing micro-hydro, solar photovoltaic (PV), and solar hot water systems on his own land, Don continues to design many more for customers across Vermont.